The white area at the bottom is where you walk, and you might be able to look out from the top. If that's where you walk, then you need to make it bigger, so more penguins can be there. Maybe we should pay coins to get in! It would be great for one of our new rooms, and awesome to redecorate for parties. yeah, and NO more rooms for now please! Yup. We don't need anything else at the moment. If anyone wants to design a room from the official list, please do. Spookkid, I am going to give you 15 coins for your effort! This may be used in-game. Heres a re-do of it. You would probably take a boat to it. If you want me to fix it anymore, just tell me. The original is better. Look at the penguins in the logo to see how it should look. So, mainly you want me to change the eyes? Yup that is basicly what he wnats you to change. 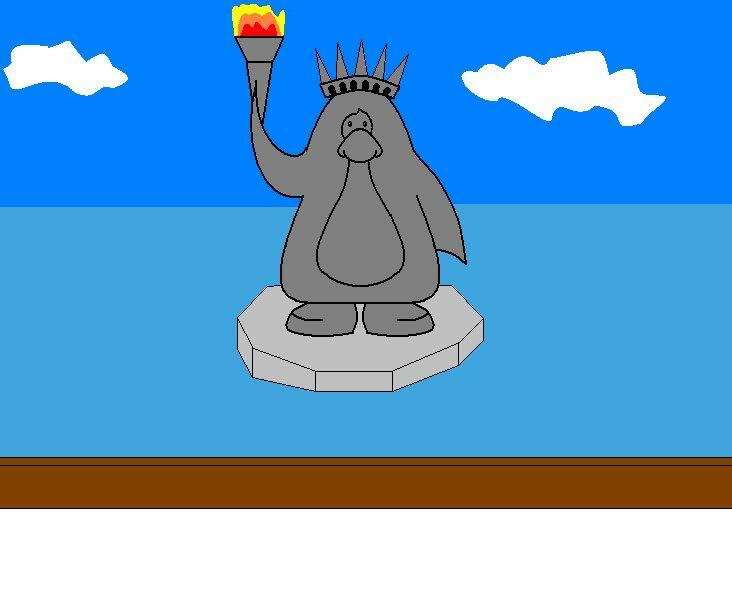 i have an idea, there would be a telescope and you could look in the telescope and see the statue of pengerty, and like someone else fantastically said, it could be decorated for parties! Great idea! Keep them coming! Awesome! Thats very good for doing that on the computer. Subject: Re: Statue of Pengerty.